If you posted your #2015bestnine on Instagram last year, you could be part of a new dating app. Toward the end of last year, a new meme surfaced on Instagram to help users find and share a grid of their nine most-liked Instagram pictures. Now that same service thinks Instagram users can use those nine photos to find a hot date. BuzzFeed is reporting that the company behind the #2015bestnine Instagram meme has released a new dating app called Nine. This app relied on the #2015bestnine meme going viral to drive the number of early sign-ups to a then-mysterious app to “match with other Instagrammers.” Except it wasn’t clear that it would be a Tinder-style dating app. This is what Beyoncé’s dating profile photo would like on Nine. According to BuzzFeed, 15 million Instagram users used the service to post their #2015bestnine, a grid made up of their nine most-liked photos in 2015. The service then emailed these people offering them a chance to pre-register to a “match-making” app, which 130,000 people did. For these Instagram users-turned-online dating guinea pigs, their #2015bestnine pic is now their profile photo on the Nine dating app. Update: The Nine team has reached out to explain how the 130,000 emails were collected. The #2015bestnine photos were created using just an Instagram ID and no login was required. The page that showed the #2015bestnine collage also had a message at the bottom prompting users to enter their email addresses to be alerted about Nine’s forthcoming app. “For those 130,000 users who signed up, we gave priority by sending them an email inviting them to download the app upon its release, after which they would click a link, download the app, and log in using their Instagram account before actually becoming Nine user,” Nine explained in a blog post. 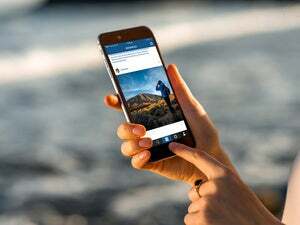 However, Instagram users might have thought that meant meeting other foodies, pet lovers, or similarly minded friends based on your most-liked Instagram photos. It does not explicitly convey that Nine would use your #2015bestnine solely to strike a romantic connection. Why this matters: Piggy-backing on an Instagram viral meme to launch an app seems like a brilliant idea. Nine now has 130,000 users on day-one. And according to BuzzFeed, most of Nine’s inaugural users are in the 18 to 24 age range, while 76 percent are women. But Nine’s use of ambiguity in order to get people’s information might be a major turn-off for some users. When the #2015bestnine meme was going around, a few people raised privacy concerns about letting a random service access their Instagram profiles. The fact that the service used the information to pre-populate a new dating app proves that the concerns were highly valid.